On 21 Oct 2016, Zamaneh Media commemorated ten years of reporting, publishing, documentary film making and civil society capacity building in a daylong conference and festival titled “Iran: the Road Ahead”. Radio Zamaneh, a media organization that was founded in 2006, has evolved its unique media model and believes “in a strong community and high participatory level of news gathering and sharing,” says Rieneke Van Santen, the Executive Director. 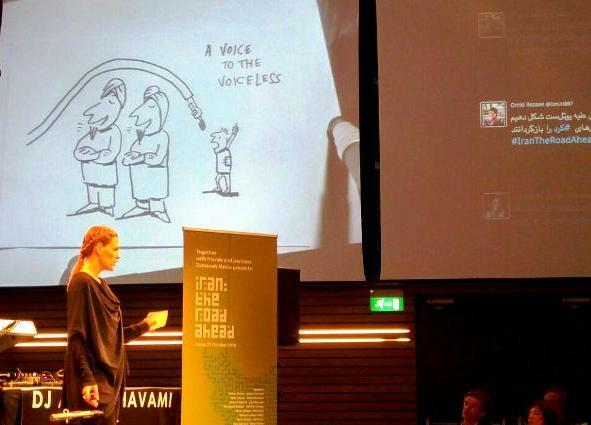 In order to better reflect activities of the above-mentioned platforms, on the occasion of the 10th year anniversary festival called “Iran: the Road Ahead”, Van Santen officially presented the new name under which they will be operating: Zamaneh Media Foundation. Yet even with the adaptation of a media participatory model, Van Santen believes that Zamaneh’s mission founded in August of 2006 is still very much alive today: “To be a voice to the voiceless”. She also expressed gratitude to the steady, loyal and active audience base that bring over 14 million online visits per year for Zamaneh Media. Zamaneh’s journalism is built on strong analytical reporting that covers the story behind the news and that promotes and strengthens independent critical thinking; this is of utmost importance for Iranian society according to Van Santan.